Hegemon at work on Iran, doing what hegemonic powers do. No war needed – or likely. Summary: As the sanctions tighten like a noose around Iran, the US deploys its power on Iran’s borders to discourage resistance. It’s a simple plan to slowly break their will, with Iran’s nukes as a pretext. So far it’s working. Only China or Russia can save Iran. They probably will not do so. Fear-mongering by the usual sources about war will probably again be wrong. The US has been keeping two carriers in the Middle East. DoD announced yesterday that a third will be deployed there. The USS Enterprise is on station in the Middle East. It deployed from Norfolk on 11 March, and is scheduled for decommissioning on December 1. The USS John Stennis deploys late this summer from Bremerton, WA. It was scheduled to deploy at the end of the year; it will take about one month to get on station. See the DoD news release here. 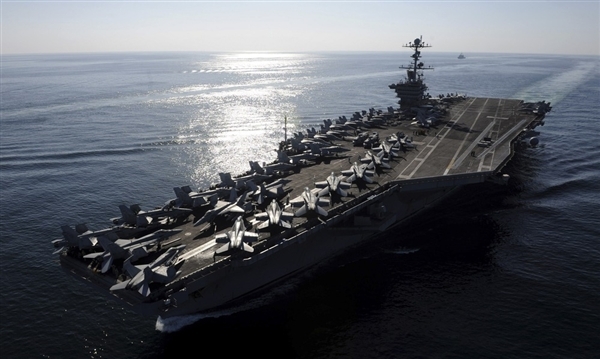 The USS Eisenhower deployed from Norfolk on 20 June, to relieve the USS Abraham Lincoln — which left Persian Gulf area on 16 July. The French nuclear aircraft carrier Charles de Gaulle is said to be sailing to the French naval base at Port Zayid, Abu Dhabi. It is only 44,000 tons (US short tonnes); for comparison the US Nimitz is 112,000-plus tonnes. What does Jesus say about atomic weapons and mass killings? The Pentagon is building a missile-defense radar station at a secret site in Qatar and organizing its biggest-ever minesweeping exercises in the Persian Gulf, as preparations accelerate for a possible flare-up with Iran, according to U.S. officials. The radar site will complete the backbone of a system designed to defend U.S. interests and allies such as Israel and European nations against Iranian rockets, officials told The Wall Street Journal. The minesweeping exercises, in September, will be the first such multilateral drills in the region, and are expected to be announced by U.S. officials Tuesday. The Pentagon’s moves reflect concern that tensions with Iran could intensify as the full weight of sanctions targeting the country’s oil exports takes hold this summer. Though U.S. officials described both the radar site and the naval exercises as defensive in nature, the deployments likely will be seen by Iran as provocations. … The U.S. moves are intended to address the two Iranian offensive capabilities Pentagon planners most worry about: Tehran’s arsenal of ballistic missiles and its threat to shut down the oil-shipping lanes of the Strait of Hormuz by mining them. Underscoring concerns, the Pentagon said Monday it is sending an aircraft carrier, the John C. Stennis, to the Middle East several months early to ensure two carriers are present in the region at all times. … The Pentagon chose to place the new radar site in Qatar because it is home to the largest U.S. military air base in the region, Al Udeid Air Base, analysts say. More than 8,000 troops are stationed there and at another U.S. base in Qatar. … The radar base in Qatar is slated to house a powerful AN/TPY-2 radar, also known as an X-Band radar, and supplement two similar arrays already in place in Israel’s Negev Desert and in central Turkey, officials said. Together, the three radar sites form an arc that U.S. officials say can detect missile launches from northern, western and southern Iran. Those sites will enable U.S. officials and allied militaries to track missiles launched from deep inside Iran, which has an arsenal of missiles capable of reaching Israel and parts of Europe. Intelligence agencies believe Iran could have a ballistic missile as early as 2015 that could threaten the U.S. The radar installations in turn are being linked to missile-interceptor batteries throughout the region and to U.S. ships with high-altitude interceptor rockets. The X-Band radar provides images that can be used to pinpoint rockets in flight. Officials said the U.S. military’s Central Command, which is overseeing the buildup to counter Iran, also wants to deploy the Army’s first Terminal High Altitude Area Defense missile-interceptor system, known as a THAAD, to the region in the coming months, possibly in the United Arab Emirates. The THAAD has its own radar, so deploying it separately from the X-Bands provides even more coverage and increases the system’s accuracy, officials said. The X-Band radar and the THAAD will provide an “extra layer of defense,” supplementing Patriot batteries that are used to counter lower-altitude rockets, said Riki Ellison, chairman of the Missile Defense Advocacy Alliance, which supports developing and deploying the systems. The military build-up discourages Iran from responding with military force, in effect holding them in our garrote until their national will to resist the US breaks. Too bad for Iran that they don’t have a nuke program; today that’s the only security in this world. Americans don’t like to see themselves as an overbearing global hegemon. To hide that harsh truth the news media describe Iran as an awesome power threatening the world. The war drums the occasional note of reality from experts, including the US intelligence community and former senior Israeli intelligence officials, that Iran probably does not have a program to build the bomb. Just like Saddam’s terrifying army in 1990, and his WMDs in 2002. We’re lied to so often by the news media that we’ve come to accept lies as truth. At this point it seems that Iran will break, eventually, in some fashion. Unless Russia or China intervenes. Or, unless the US, Israel, or Iran choose to attack. None of these scenarios seem likely. Bet that Iran will crack. There’s also the second order effects of the sanctions, especially on the Iranian people, see this article for an example: “Iran’s Aging Airliner Fleet Seen as Faltering Under U.S. Sanctions“, New York Times, 13 July 2012. Sanctions have prevented the Iranians from buying new aircraft or spare parts over the last 17 years, contributing to the deaths of approximately 1700 Iranian civilians in aviation accidents in that time. Similarly trashing Iran’s economy through financial sanctions is probably going to have some nasty long term effects on Iran’s citizens, which will garauntee their hatred of us for years to come. thank you very much for pointing out this oversight, an major factor not mentioned in this series about our conflict with Iran: the effect of sanctions on Iran’s people. We’ve seen how this worked in Iraq. A question for our readers: how do Iraq’s people feel about the sanctions? Do they hate the US for imposing them on Iraq? Based on conversations I’ve had with Iraqis, it would seem that people suffered greatly under the sanctions, and they remember this suffering very clearly, and they blame the United States. At the time of the invasion, many Iraqis were overjoyed because they thought it meant the end of the siege and the beginning of a new age of American-led development and prosperity. Nowadays, memories of the sanctions combine with the horrific memories of the much worse things that have happened since the invasion to generate an almost universal simmering resentment, which in some people manifests itself as open hatred, and in others is submerged for pragmatic reasons. Thanks for the comment! First person information like your is always valuable. Regarding the lasting feelings for our sanctions of Iraq, I think that the more recent violent deaths of so many of its people overshadows the subtle effects of so many people dying of disease, deprived of medications and water purification materials. I wonder how this plays out with certain demographics in the upcoming 2012 general election. Seems partisan Democrats are playing off the whole “If Republicans win they’ll start a war with Iran!”. Seems likely neither party wants, just more (brutal for the people of Iran) sanctions. I wonder about that. It seems like the leaders of both parties support a war with Iran, although perhaps the GOP leaders are more enthusiastic about starting one now. I find a war with Iran unlikely imo, if for no reason lack of viable funds to commit to it (but I guess it’s still possible) If war really is on the table though…, I think it’d happen under both an Obama & Romney president. Agreed that both parties support war with Iran. And that, as I have written so often, these days “all American Presidents are War Presidents”. That’s a great analogy! Of course, with Iran the stakes and risks are far larger than with Cuba. This is the Middle East, not latin America. And Iran is a developed state, not a third world nation like Cuba. If Cuba had oil, they’d be part of Florida by now. I keep thinking I’m watching some kind of comedy movie. A nuclear-armed super power is surrounding another country with nuclear-armed carrier task force groups and (no doubt) has ballistic missiles aimed at a country’s cities while screaming that they’re a bunch of crazed nihilists that will do extremely stupid things if they get nukes. I suppose we ought to know. Oh I don’t think there is anyway now of NOT having a war, the probability is now 90%+. You have a Congress determined to force the Administration into war. You have the same Administration, overall, being slightly ambivalent, but making all the steps for a war. Within the said Administration, there are actors (Clinton for example) who want a war and are manoeuvring towards such. Plus the usual relentless Israeli ‘push’ and even some Saudi ‘push’. 1. Something will happen, some incident that they can claim “they started it”. Might even make one up, ah lah “Gulf of Tonkin”. Or the usual Israeli ‘false flag’ thing, they would quite happily kill a US ship if it meant the US would go to war with Iran. Trouble with them, they have done so many of these things that it has become too easy to believe that they blew up their own people recently. If any terrorist thing happens in the west these days, my first thought is now “wonder if the Israelis did it”. 2. They will put a full blockade on Iran, “because negotiations broke down”. There are no negotiations, just US demands, which even if Iran complies (which it has done in many cases) will be ignored .. then the US will demand something even more .. just as before Iraq. People forget how close we got in 2006/07. Only Bush blinked, though Chaney wanted war with Iran. Coordinated with Israel, which is why the 2006 invasion of Lebanon happened then (and planned for at least a year beforehand). The basic plan was Israel takes south Lebanon (realising a long held dream of the Greater Israel) the US takes out Iran. What could possibly go wrong? Sadly for them Israel got absolutely thumped (again). And the US had the ‘revolt of the Generals’, where, initially large numbers of retired ones went public with their opposition and then later serving ones threatened to resign. And the CIA (etc) also essentially revolted with their report. And, as I said, Bush blinked. Now the CIA is under Petreaus’s caring hands and all those (such as Admiral Mullen) are gone. So game on. It’s going to be a wild ride. The only question is when, before the election or afterwards and that will depend on the political calculations by Obama, will it give him more votes or not? My guess is that if the election is close, then it will be before (most probable). If Obama is well ahead in the polls then it will be after, so as to give more time to weaken Iran and for Israel to get ready. If after the election, then it will be Israel that determines the timetable, since they will want to hit Lebanon, possibly Syria at roughly at the same time. Given past history that makes it May-July 2013, the traditional time of the year for Israeli attacks. But, of course, these things tend to have a life of their own and can spin out of control real fast. Plus there is the time factor. The US can’t keep all those forces there for too long. Eventually some of the aircraft carriers and other forces will have to leave, which will be seen as a climbdown, so we also have a “use it or lose it” element as well as the “face’ factor. Plus the wild card at the moment .. Syria. So the risk time (ie 90%+) is from August to July next year. If, by some miracle we get to then and nothing has happened, then the risk will start to drop. I think any US intervention will be after the election. The Russians and the Chinese were not happy with the results of being pushed into letting the West intervene in Libya and have been digging in their heels ever since. The US government highly values the political cover it gets from working under UN auspices. Another issue is that Syria needs to be resolved before the US can concentrate all of its powers on Iran and I don’t see the current crop of leaders getting so overconfident that they think we can fight three wars (Afghanistan, Iran, and Syria) at the same time. The uncomfortable thing is that I see the US military turning its eyes on securing the US borders, particularly the southern one. This strongly implies that they will start using military force to ensure that the Mexican war with the Drug Lords ends with the Drug Lord’s defeat. The logical way to do this is to declare the Drug Lords to be terrorists (and you can make a better case for that than you can for a number of people who have been in Guantanamo for the last 10+ years). An extension of that is that everybody who gives the Drug Lords money are supporting terrorism. That implies the 8-10% of the US population that consumes these drugs can be stripped of their rights and property. Israeli and U.S. politicians lately have been bandying about the prospect of an airstrike on Iranian nuclear facilities, stirring fear that another destabilizing clash could be provoked in a region already rife with civil war in Syria and other religious and political tensions. But nonproliferation experts and Middle East analysts are skeptical of Israeli claims that the Tehran regime is so close to building a nuclear weapon that time is running out for a peaceful resolution of the decades-long standoff. “This is a window that has been closing for 15 years now, and it’s always imminently about to close,” said Jamal Abdi, policy director for the National Iranian American Council. He sees the sudden flurry of diplomacy between Jerusalem and Washington as an outgrowth of the U.S. presidential campaign and Israeli interest in ensuring that the United States continues to hold a hard line against Iran. DoD announced on July 16 that the USS Stennis was deploying to the Middle East. It will replace the USS Enterprise, which will be decommissioned in December. It’ left 3 months early in order to continue the current policy of keeping two carriers on station in the Middle East for 9 months of each year. DoD had planned to return to a more normal deployment schedule, as this puts great stress on the crews. In 2010, then-Secretary of Defense Robert Gates ordered a second carrier to the Persian Gulf area to support the Afghanistan troop surge and troop drawdown in Iraq. Since then, there have been 1.7 carriers in the region — 2 for 9 months and one for the other 3 months. One is generally in the Persian Gulf while the other operates in the Arabian Sea, providing air support for the war in Afghanistan. The directive was going to expire in September, when the USS Enterprise would be completing its final deployment and leaving the USS Eisenhower as the sole aircraft carrier in the Middle East. The U.S. Central Command, which covers the Arabian Gulf and Arabian Sea, asked to keep a second carrier in the region, and Defense Secretary Leon Panetta agreed. The Stennis’ deployment orders were changed and it will leave 4 months early for the Middle East, the Navy announced on July 16. ABC News and the Navy Times also reported this.